Revered actor Bille Brown died in January this year from cancer. His career took him from the Queensland town of Biloela to stages around Australia, the Royal Shakespeare Company, London’s West End and Broadway. He also appeared in many films, wrote and directed. Mertim Gokalp met Brown through a mutual friend, visual artist Jodie Lee Behrendorff, who suggested he paint Brown for the Archibald Prize. ‘From the moment Bille entered my studio, he filled it with his great energy and laughter. His impressive voice and hypnotising gaze were remarkable,’ says Gokalp. ‘He did not tell me about his sickness, perhaps he did not know then or he did not want to tell. ‘Learning of my Turkish background, he told me he had studied Sufi poetry in Turkey. From that moment, he started to call me “my little Janissary” (referring to trained soldiers of the Ottoman Empire). After discovering Bille’s interest in Sufi poetry and his great knowledge of Ottoman history, I felt that painting him in a Turkish bath would be fantastic. Born in 1981, Gokalp moved to Sydney four years ago from Istanbul, Turkey. 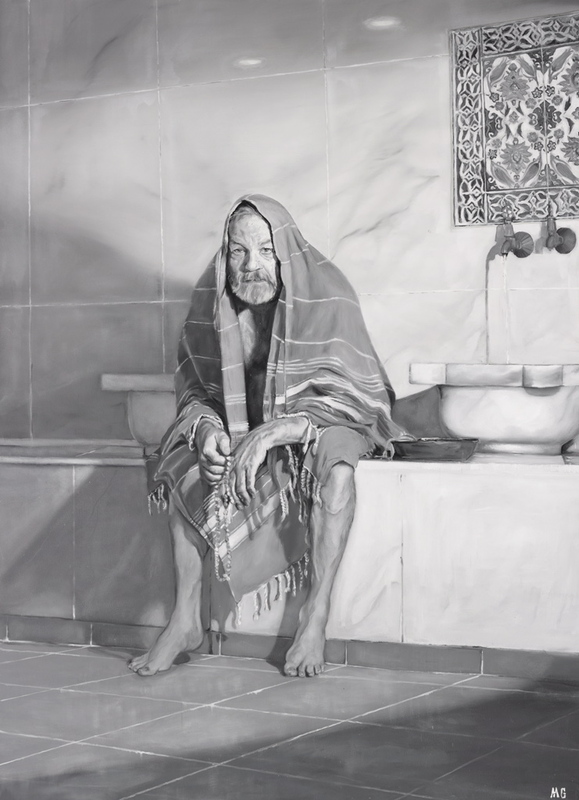 He studied painting at Mimar Sinan University in Istanbul. The subtle detail in his portraiture reflects his strict art discipline. He was a finalist in the 2011 Black Swan Portrait Prize.